A guide intended to provide comprehensive information to Philadelphia residents regarding the papal visit will be published online Monday, Mayor Michael Nutter announced Thursday afternoon. Nutter also responded to comments made by former Gov. Ed Rendell, who criticized the Secret Service Wednesday for planning to construct fenced security perimeters surrounding areas where Pope Francis will host public events. Rendell said it "boggles the mind" that the United States must put up security fencing while other countries have not. The "Papal Playbook" will detail a wide range of information on both the World Meeting of Families and the papal visit, including transportation options, special events, emergency notification information and additional resources. "Our goal is to offer a single access point, one place to go for the distribution of correct information," said Donna Crilley Farrell, executive director of the World Meeting of Families. The "Papal Playbook" will be available Monday at noon on the World Meeting of Families website. Residents can pre-register to receive it via email here. 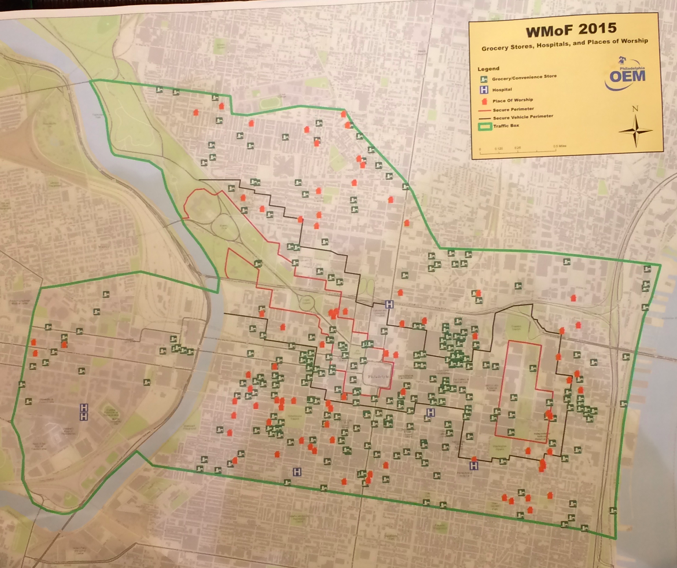 The city also unveiled a map, shown below, detailing the various grocery stores, hospitals and houses of worship located within the 'traffic box,' a three-square-mile area in which only emergency vehicles can enter during the papal visit. Residents who live within the 'traffic box,' which encompasses Center City and some surrounding neighborhoods, may drive their vehicles within portions of that box. But any vehicle that exits the 'traffic box' will not be able to re-enter until the conclusion of the papal visit. Nutter did his best to assuage the concerns of Center City businesses and residents, who will be the most affected by the papal visit, and keep a positive light on the event. "We have worked hard to minimize the impact felt by our residents," Nutter said. "Less than 7 percent of the city's entire population lives in the 'traffic box.'" Rendell criticized the Secret Service for its plans to erect fenced security perimeters surrounding the Parkway and Independence Mall while speaking to Angelo Cataldi on 94 WIP. Rendell added that Pope Francis would be "aghast" to know seniors might have to walk several miles to see him. Nutter, who was praised by Rendell, responded to those remarks by noting that security fencing is present at the presidential inauguration and other mega-events. "Our primary focus is making sure that, from the Secret Service, police and Homeland Security standpoint, they will secure the safety and security of the pope," Nutter said. "These issues are really about the safety and security of the public and their ability to get around. "But if anyone thinks that they're going to walk up and give Pope Francis a high-five, that's probably not going to happen. You can't do that to the President of the United States either." Nutter said his office has had frequent talks with Secret Service officials, describing them as "frank and honest discussions" in which there is "pushing and shoving" from both sides. "We've asked for some things; they've asked for some things," Nutter said. "They've done some of the things that we've asked for. And we've agreed to some of the things they wanted." Nutter also addressed concerns that the massive highway closures and security perimeters are scaring outsiders from making the pilgrimage into Center City to see Pope Francis. Many Center City hotels still have vacancies, despite the papal visit being five weeks away. SEPTA has struggled to sell the special passes required to ride its Regional Rail system during the papal visit. More than 100,000 remain available. The prospect of walking considerable distances to simply see Pope Francis on a jumbo screen on the Benjamin Franklin Parkway also may have some potential attendees rethinking their plans. Nutter admitted he has no real way of knowing whether Philadelphia actually will bring in the anticipated 1.5 million people for the papal mass. But using past papal events as a guide, Nutter said he still expects a lot of people. "Folks are not RSVPing to our office, so I don't absolutely know how many folks are going to come," Nutter said. "We're 30-plus days out. People are still trying to figure out what they're doing. I think there will be a lot of people. We have to plan and anticipate that there will be a lot of people here." Pope Francis will visit Philadelphia on Saturday, Sept. 26 and Sunday, Sept. 27. He will deliver a speech on immigration and religious liberty outside Independence Hall on Saturday before participating in the Festival of Families on the Benjamin Franklin Parkway. On Sunday, Pope Francis will serve mass on the Parkway, an event that is expected to bring as many as 1.5 million people into Center City. The papal visit will shut down major roadways and the Benjamin Franklin Bridge. Most vehicles will be forbidden from entering a 'traffic box' encompassing Center City. Only registered buses and emergency vehicles will be permitted entrance. Residents with cars inside the box may drive within select areas, but cannot leave the 'traffic box' and re-enter. Nutter said trash and recycling will be suspended on Friday, Sept. 25 and Monday, Sept. 28. He asked residents to hold their trash and recycling until the following week or deliver it to one of the city's five Sanitation Convenience Centers, which will have extended hours from Sept. 24 to Oct. 4. The centers will be open from 8 a.m. until 8 p.m. Taxi cabs will not be permitted within the 'traffic box' during the papal visit. They can access the area until 2 a.m. Saturday, Sept. 26 and may re-enter at 3 a.m. Monday, Sept. 28. However, 27 taxi cabs, compliant with the Americans with Disabilities Act, will be available within the traffic box to transport attendees with disabilities. "At the moment, we believe that's everything that's available," Nutter said. Traffic and parked vehicles will be forbidden inside a separate no-traffic zone within the 'traffic box.' Two fenced security zones surrounding the Parkway and Independence Mall also sit within the 'traffic box.' Only residents and ticketed individuals may enter those areas, which require individuals to pass through metal detectors. SEPTA is requiring regional rail riders to purchases special one-day papal passes. Only select SEPTA stations will be open during the papal visit as the agency attempts to shuttle passengers into Center City as quickly as possible. 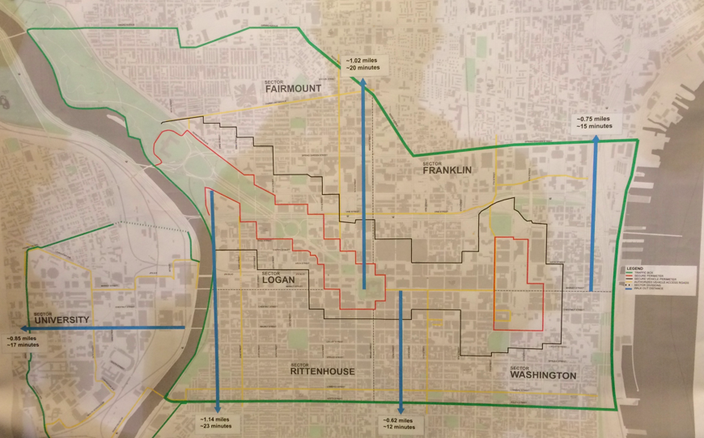 Many bus routes that typically run through Center city will be truncated. PATCO and NJ Transit also are operating on amended schedules and, in some cases, require special passes.